A small bowl of hot smoked Spanish paprika. Paprika is a powdered, generally orange-red to deep blood-red spice made typically from grinding the dried pods of sweet red bell peppers (Capsicum annuum). It is used as a seasoning and garnish is many culinary dishes. In addition, in many European countries, the name paprika also refers to bell peppers themselves, either the plant or just the bell-shaped fruit. As a spice made from bell peppers, including green bell peppers as well, paprika tends to be mild. However, the term paprika sometimes is extended to include some pungent and hot spices made from hot peppers as well. This powdered seasoning is used to add color and flavor to many dishes, and is particularly popular in Hungarian cuisine, where it is a maintstay flavoring (Herbst 2001). It offers a unique culinary experience and when prepared by naturally drying the fruits, rather than the high heat of commercial preparations, it also offers a very rich source of vitamin C.
Capsicum fruit which comes in various shapes and colors can be used to make paprika. Bell pepper is the common name for a cultivar group of the species Capsicum annuum. These plants are characterized by edible, bell-shaped fruits that have a glossy exterior of different, vivid colors, including red, yellow, orange, green, purple, brown, and black (GMF 2008). They tend to be plump, bell-shaped vegetables with three or four lobes (GMF 2008). These cultivars sometimes are lumped together with other varieties of Capsicum annuum known as sweet peppers. Bell peppers contain a recessive gene that eliminates capsaisin, the alkaloid that causes "hotness" in other plants in the genus Capsicum. The bell-shaped fruit of Capsicum plants have a variety of names depending on place and type. In many European and some other countries, they are called paprika, and sometimes referred to by their color. For example, the Dutch words "groene paprika" and "gele paprika" refer to green and yellow fruits, respectively. Likewise, in Hungarian German, Polish, Japanese, and Korean, the word "paprika" is used for the fruits, either the bell pepper or even hot pepper, of which the spices are made. However, paprika more commonly refers to the powdered spice made from various capsicum fruit. A spice is any dried seed, fruit, root, bark, or other part of a herbaceous or woody plant used in nutritionally insignificant quantities as a food additive for the purpose of flavoring, or sometimes as a preservative. Paprika as a spice is a powder made by drying and grinding the pods of bell peppers, typically the pods of red peppers (Herbst 2001). The seeds are removed from the pods, the pods dried, and then ground. Because the pods are quite tough, several grindings may be necessary to produce a powder with proper texture (Herbst 2001). The paprika spice generally ranges in color from deep blood-red to bright orange-red, and the spice tends to be mild. However, more pungent and hot forms of spice called "paprika" also are known (Herbst 2001), although these hot varieties are not actually made from bell peppers, but rather chili peppers. Red paprika originated in Southern Mexico, Central America, and the Antilles Islands, where Native Americans used it for healing and seasoning. Christopher Columbus returned from the New World with unknown spices and with never-before-seen bell pepper plants. The term "bell pepper" is one of the many names for some fruits of this Capsicum annuum species of plants. The misleading name "pepper" (pimiento in Spanish) was given by Christopher Columbus upon bringing the plant back to Europe. At that time peppercorns (black pepper, Piper nigrum) were a highly prized condiment. At first, the plants were used to decorate baroque gardens of nobility in Europe. The plant also arrived in Turkey via trade routes. From there it came to Hungary through the Balkans. In the second half of the sixteenth century, a plant was kept by a noble Hungarian lady, Margit Széchy, in her garden in Hungary. It was called the Turkish pepper (at that time also called Indian pepper or heathen pepper). The name "paprika" came from the eighteenth century as a diminutive form for the south-slavic name of pepper (papar), and then, after the Hungarian usage, the word became international and universal. The first note mentioning red pepper in Szeged, Hungary dates back to 1748, with the word paprika in an account book. In Hungary, paprika was first used as a cure for intermittent fever. It later became a typical spice of Hungarian cooking. According to the Oxford English Dictionary, the English word comes from the Hungarian "paprika," which means 'pepper' (the red spice or the vegetable). This derives from the Serbian and Croatian "paprena" that means "the one that is hot" and it is derived from Serbian and Croatian noun papar, or "pepper," which in turn was borrowed from the Latin piper, for "pepper." Delicate (Édes csemege): Ranging from light to dark red, a mild paprika with a rich flavor. Pungent Exquisite Delicate (Csípős Csemege, Pikáns): An even more pungent Delicate. Rose (Rózsa): Pale red in color with strong aroma and mild pungency. Hot (Erős): Light brown in color, this is the hottest of all the paprikas. In Poland, cans with Paprykarz szczeciński are made by many seafood producers, of steamed sea fish, rice, paprika, and onion. In India, a similar powdered spice comes from a fruit locally called "deghi mirchi," which is grown widely and takes on a slightly different flavor, depending on local soil and climatic conditions. The hottest paprikas are not the bright red ones, but rather the palest red and light brown colored ones. Paprika is used as an ingredient in a broad variety of dishes throughout the world, and is particularly popular in Hungary and neighboring countries. 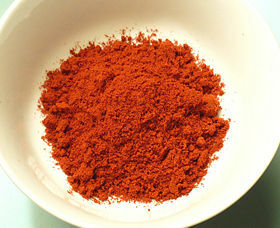 Hungarian cuisine has used paprika for a long time as a mainstay flavoring rather than only as a garnish (Herbst 2001). It also is integral in Mexican and Portuguese cuisines (GMF 2008). Paprika is essential for the flavoring of Louisiana Creole dishes (GMF 2008). Paprika (known as pimentón in Spain, colorau in Portugal, and chiltoma in Nicaragua—but these "paprikas" are not made exclusively from bell peppers, other varieties are used, and there are several hot and sweet "paprikas") is principally used to season and color rices, stews, and soups, such as goulash. In Spain, Germany, Hungary, Slovakia, Bosnia and Herzegovina, Croatia, Serbia, Romania, Bulgaria, Turkey, and Portugal, paprika is also used in the preparation of sausages as an ingredient that is mixed with meats and other spices. Paprika may be smoked for additional flavor. Paprika is unusually high in vitamin C. The capsicum peppers used for paprika contain six to nine times as much vitamin C as tomatoes by weight. Hungary's Albert Szent-Györgyi, who was awarded the Nobel Prize for Physiology and Medicine in 1937 partially for his work with vitamin C, used paprika as a source of vitamin C in 1932 (NLM). This was no problem given that he was working in Szeged, the paprika capital of Hungary. High heat leaches the vitamins from peppers, thus commercially-dried peppers are not as nutritious as those dried naturally in the sun. George Mateljan Foundation (GMF). 2008. Bell peppers World's Healthiest Foods. Retrieved June 3, 2008. McGraw-Hill Concise Encyclopedia of Science & Technology. 2005. New York: McGraw-Hill. 0071429573. National Library of Medicine (NLM). The Albert Szent-Gyorgi Papers. Szeged, 1931-1947: Vitamin C, muscles, and WWII Profiles in Science. Retrieved August 9, 2008. Nutrition Data (ND). 2008. Spices, paprika NutrionData.com. Retrieved August 9, 2008. This page was last modified on 12 August 2008, at 04:31.